This stunning classic Mediterranean villa, with an intricate carved limestone façade, tile roof and circular decorative Pavestone driveway, is situated across Volk Estates. Featuring a gorgeous finish out, this exceptionally “green home” was built with utmost attention to energy conservation, craftsmanship and luxury. 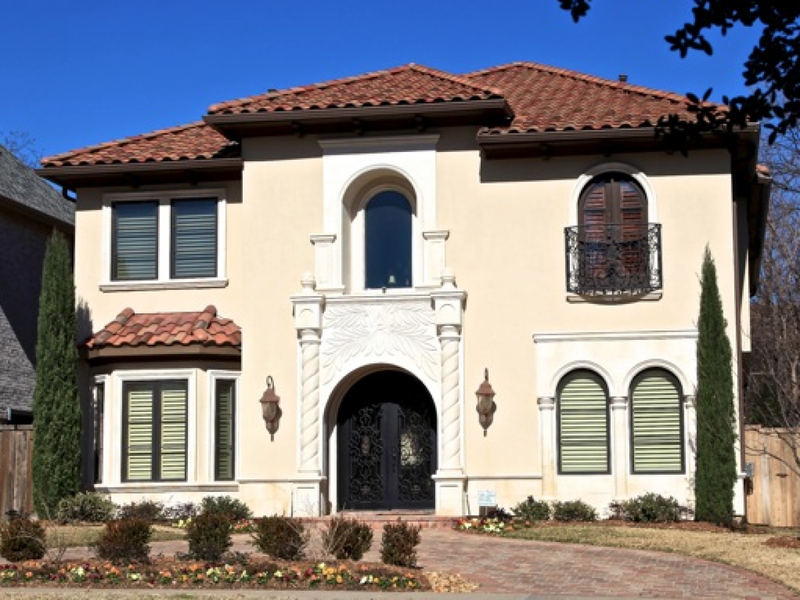 The three story, 5,306 square foot home is highlighted b tab open floor plan, 10’ ceilings, spacious entertaining rooms, custom cabinetry, deep molding, wrought iron detailing, wood windows, beautiful travertine and white oak hardwood floors, and custom lighting treatments. Enter through double wrought iron and glass doors with richly stained millwork into a 24 foot entrance hall, noting the travertine floor with onyx inlays and views of a curving staircase with wrought iron balustrades leading upstairs to the second floor. The staircase also looks up to a circular dome with an oversized wrought iron and crystal chandelier. The foyer is flanked by elegant formal rooms both with hand scraped white oak hardwoods and deep cove molding. The formal living room is centered by a hand carved wood burning fireplace with chimney breast and also features elegant palladium windows. Capped by a pop up ceilings the formal dining room is graced by a wrought iron and crystal chandelier, bay windows with custom millwork and hand-finished stone walls. French doors allow entrance into a richly stained custom Alderwood paneled library. The professionally equipped gourmet chef’s kitchen showcases custom Alderwood cabinetry, granite counters with a tumbled marble backsplash, premier stainless steel and paneled appliances, an island with an antique copper hammered bar sink, butler’s pantry, a large walk-in pantry and a spacious breakfast area with built-ins and a storage closet. The kitchen flows into a great room which is crowned by a cross beamed ceiling and also features a hand carved exotic marble fireplace. A wall of floor – to –ceiling windows provides natural light on the hardwoods and a door opens to a covered patio. Serving this area is a wine grotto. There are four bedrooms and four baths on the second floor that include a luxurious n=master suite with 11 foot double pop-up ceiling trimmed with deep cove molding, neutral carpet and a spa-like granite and travertine bath with his and hers vanities, a vanity desk area, separate double shower, jet tub and his and hers walk-in closets. Additionally there is a home theater on the third level.